Nikon Coolpix S50c Manual is aimed to fulfill the needs toward information of both technical or instrumental issue among this digital camera product especially for Nikon Coolpix S50c. The Nikon Coolpix S50c is the same previous model of Coolpix S50. It is just add 802.11b/g technology to the Coolpix S50c. The S50c sports the same slim form factor, 3 inch LCD, 7.2 megapixel resolution, 3x optical zoom, and optical Vibration Reduction. This model offers 13MB of built-in memory, Secure Digital/MultiMediaCard slots, and both USB computer connectivity plus NTSC/PAL video output. The S50c draws its power from a proprietary lithium-ion battery. When Nikon Coolpix S50c was firstly released to the market? How much the price when Nikon Coolpix S50c firstly released? Nikon Coolpix S50c is a good choice for anyone who wants an easy to use camera that delivers good-looking pictures with pleasing color and plenty of resolution. It was announced by Nikon on June, 2007. Even if it’s already released quite long time ago, but this product is still relevant for nowadays use, especially for you who likes retro camera kind of style. Dimensions: 3.8 x 2.3 x 0.8 in. In the first release, The Nikon Coolpix S50c pricing set at about $350.00 body-only. Now, if you’re interested to own this compact digital camera device, you can get it in several online stores by paying for the used products start from $30.00 of the Nikon Coolpix S50c 7.2 MP Digital Camera with 3x Optical Vibration Reduction Zoom and Wifi Capable. digital camera especially of Coolpix S50c models. Read this manual thoroughly before use, and keep it where all those who use the product will read it. 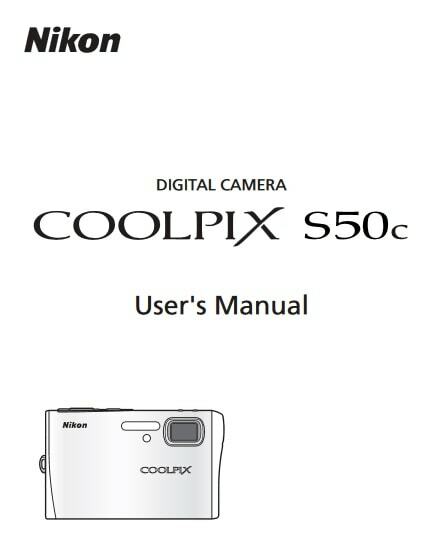 Feel free to download the nikon coolpix s50c manual user guide at below. Visit here to go back for the list of Nikon User Guide here.